Divorced couple unexpectedly meet each other during their honeymoon and rekindle their love. Sam 'Slick' Brown: Pull yourself together, William! What's a confidence man without confidence? O'Henry's short stories are a joy to read. This master of the genre left behind a number of small gems that never seem to go out of style, as they are timeless. The author had an incredible eye to spot situations in which human beings are shown at a moment of crisis only to have fate intervene with ironic twists. 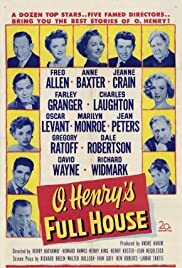 "O'Henry's Full House" offers five of his best works directed by five distinguished directors. Howard Hawks, Henry Hathaway, Henry Koster, Henry King and Jean Negulesco do an excellent job in bringing the five stories to the screen adapted by some of Hollywood's best writers of the time in which they were filmed. John Steinbeck does the introductions. The first story, "The Cop and the Anthem" presents us with Soapy, brilliantly played by Charles Laughton, as a poor homeless person in the middle of a crude winter in New York who wants to be taken to jail in the worst way. He goes to extremes to have him sent to prison, without much luck. David Wayne plays his pal Horace and Marilyn Monroe is seen briefly at the end. The second installment, "The Clarion Call" shows a police detective, Barney, and his adversary, Johnny, a man to whom he is tied by a loan that stands between them. Dale Robertson is Barney and an annoying Richard Widmark plays the bad guy. Unfortunaly, Mr. Widmark's performance full of silly laughter and tics ruined the story for this viewer. The third tale is "The Last Leaf". We have two sisters in the middle of a blizzard in Manhattan. Joanna, played by the fine Anne Baxter, who we see after an apparent breakup with her boyfriend, gets pneumonia as a result of her exposure to the elements. Her good sister Susan goes crazy trying to nurse Joanna to health. Enter the painter Behrman, who is the upstairs neighbor to the rescue. Behrman sells his painting in order to buy medicine and when Joanna in her feverish state believes the tree across the street full of dry leaves is an omen, because as the leaves keep falling, so are the chances for her to get well. Thanks to the caring painter, Joanna survives. Jean Peters plays the kind sister and the wonderful Ratoff is the painter. The fourth segment is the weakest. "The Ransosm of Red Chief" presents us two con men in Alabama kidnapping a young boy who is wiser and acts much older than what the two con men thought. Fred Allen and Oscar Levant play the kidnappers. The last, and perhaps the best realized story of the O'Henry's stories is the unforgettable "The Gift of the Magi", which is the equivalent to Dickens' "A Christmas Carol". As directed by Henry King and played wonderfully by a beautiful Jeanne Crain and the handsome Farley Granger, this is a story about love and sacrifice under the worst possible circumstances. Della and Jim, with their youth, are penniless, yet, they sacrifice whatever little each one has in order to give the other partner a small token as proof of their love. This is an immensely endearing film thanks to the legacy of O'Henry.